A colorful Etsy shop called Paper Displays of Affection caught my eye recently. It's owned by Suanne, a real estate consultant for a busy accounting firm in New York City by day, but evenings and weekends she satisfies her creative side by making origami objects, something she's enjoyed doing since childhood. 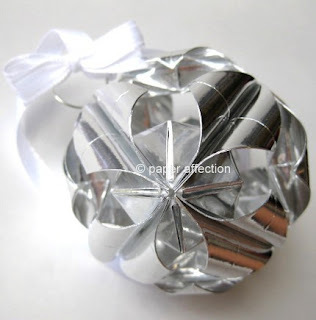 I can just picture a Christmas tree with shining ornaments like this one hanging from the branches. 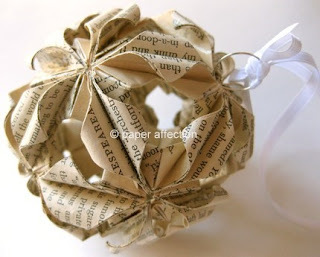 Here's a wordy variation that makes lovely use of the pages of an old book - recycling at it finest. 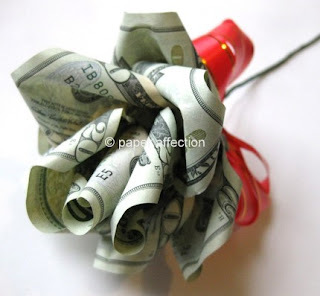 A money rose takes the guess work out of selecting the perfect graduation gift. You can't beat natural light. Try taking photos near a window, making use of the indirect light - this works well to not bleach out your shots. Use a tripod for the clearest result and also a solid, uninterrupted background - something as simple as a large sheet of white paper does the trick. Use the macro setting on your camera and then adjust the contrast and hues with a photo editing program until you get the look you're after. She admits it's definitely a trial and error process, but judging by her crisp Etsy shots, I'd say it's time well spent. Hi Ann...Your right this work is Extraordinary! You commented on my embossed and sewn greeting cards on Craftstylish and I followed you to your blog and on twitter! I like your quill work! Left a comment on twitter for you.